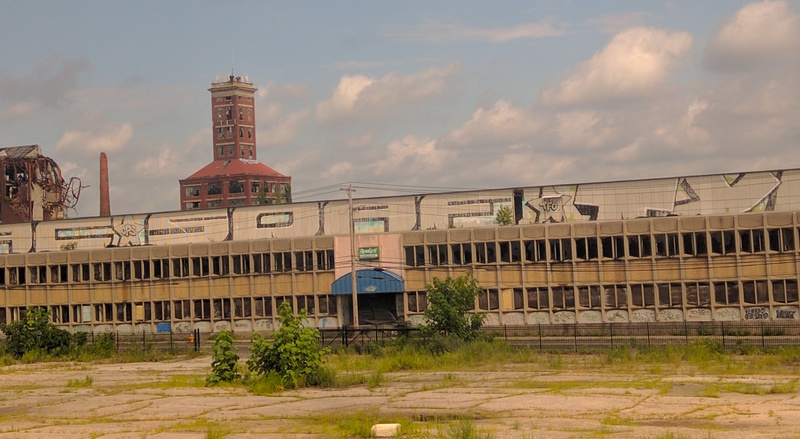 A derelict factory building in Bridgeport in August. Connecticut’s urban centers are shackled by unemployment, homelessness and other poverty indicators that dwarf those of surrounding suburbs, the state’s chief municipal lobbying group wrote Monday in a bulletin to state legislative candidates. The Connecticut Conference of Municipalities also wrote that Bridgeport, Hartford, New Haven and Waterbury combined provide work for 75,000 suburban residents who commute into these centers. The poverty rates in each of the four cities are at least twice as high as the state’s overall poverty rate. Together these cities are home to about 500,000 people. Together these cities account for more more than half of Connecticut’s homeless. The cities’ unemployment rates range from 7.7 percent to 11 percent — all above the state average of 5.9 percent. Students in New Haven and Waterbury qualify for free or reduced school lunches at more than twice the statewide rate, while in Hartford and Bridgeport it is nearly three times the state average. The equalized municipal property tax rates in all four cities are higher than the state average. And the crime rate in Hartford, New Haven and Waterbury all exceed double the state average, while Bridgeport is nearly double. The CCM report comes a few weeks after Hartford Mayor Luke Bronin appealed to a state advisory panel to help him convince legislators to overhaul Connecticut’s municipal finance system. Hartford’s budget this fiscal year is $22.6 million in deficit, a shortfall of about 8 percent, Bronin told the Municipal Finance Advisory Commission on Sept. 15. And the gap balloons to $50 million, or almost 20 percent of total expenses, in 2017-18. Hartford’s bonded debt is driving a significant portion of that red ink. Further complicating matters, Hartford already has Connecticut’s highest property tax rate — at 74.29 mills or $74.29 for every $1,000 of assessed property value. And 51 percent of its property value is exempt from taxation. That includes hospitals, universities, an airport, a trash-to-energy plant, and numerous state offices and facilities. 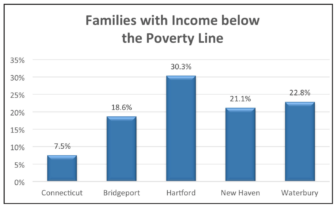 The city’s median income is about $29,000 per year, and 46 percent of Hartford children live in households with incomes under the federal poverty line.